How much computing power does a 10W CPU offers and how much power does it really consumes? After building a PC with Celeron J1900 it's time to run some benchmarks. Aside of other Intel CPUs there are AMD competitors like new Sempron and Athlon 25W CPUs with good graphics or the old E-350 that is still available on the market. Most of them are similarly priced. To run benchmarks I've used phoronix benchmark tool, as well bootchart for system boot up time charts and power usage monitor to check how much power the PC is taking. The phoronix test suite is handy for running multiple tests, making charts and running comparison benchmarks on other machines. Lets start with some AMD comparison. Phoronix.com did a Sempron/Athlon benchmarks recently and they tested E-350 too, so I've run comparison benchmarks. J1900 gets better results than much older dual core E-350. Usually the results are twice as better, except of SSL where E-350 is better. J1900 lacks cryptography related instruction sets that speed it up. In case of Semprons the results look quite good too. J1900 usually looses only against strongest Athlon 5350, while it wins with weakest quad core Sempron 3850. It's quite positive that Ivy Bridge graphics available in J1900 can compete with graphics in those AMD processors. The Bay Trail processors use Ivy Bridge graphics, although bit limited as they have 4 EU and not 16 like in HD4000. Celeron J1900 is the first quad core in line of desktop Bay Trails. The strongest one is Pentium J2900 which has higher CPU frequency. I've added MSI laptop into the results to set the upper scale limit as it's equipped with i7-4700MQ. The Pentium G840 is EOLed (discontinued) old CPU based on Sandy Bridge architecture with 65W TDP and also 1333 MHz RAM support. As you could expect the J1900 can't compete against Core i7 quad core CPUs. Comparing with G840 you can see it achieves similar results while being 10W CPU. What's less nice is the slow RAM speed on J1900. I don't know why Intel slowed down the RAM for J1900 - maybe because of power usage or for low price. Slow RAM may limit integrated graphics performance. Phoronix did many RAM tests for AMD integrated graphics with shared memory and RAM speed had noticeable effect on GPU performance. In the case of Intel similar dependency should exist. The Pentium got few framerates better results in games than J1900 and also bit better RAM speed results. In games, 3D first person shooters the results doesn't look to good. Only Xonotic on low settings seems playable. When I installed those game from the Xubuntu repository all of them (UrbanTerror, OpenArena, Xonotic) worked on default settings and were playable. The phoronix benchmarks use bit older versions and usually increase details settings to stress the GPU more. For me the GPU must be able to allow casual shooting in games like UrbanTerror, as well as multimedia handling - zero problem movie playing or Flash/HTML5 on Youtube. J1900 can do it so it's ok for me. For benchmarks or for more demanding games the strongest Athlon would be a better pick. Also note that Intel has open source drivers and there are rather problem free. AMD likes to have problems from time to time or lag with support for some Kernel releases (but still if the drivers work they do it well). In the compilation time benchmark I've added AMD Phenom II X4 960T, which is used in my office dev machine. It's quite old 95W CPU that can make fans noisy, and the PC can use more than 100W of power easily when noticeably used. J1900 is bit slower in compilation so compiling numpy or pillow would take bit more time when making new virtualenvs, but still it's not that bad. What's worth to notice is how performance of 95W CPU gets into 10W CPUs, and we don't have Broadwell yet, which will lower power usage even more. Using power monitor I've watched how much current does the PC takes (without displays). When the CPU isn't used much the whole PC takes around 25W. At higher load it will take more than 30W. Max usage I've noticed during tests was 37.5W. 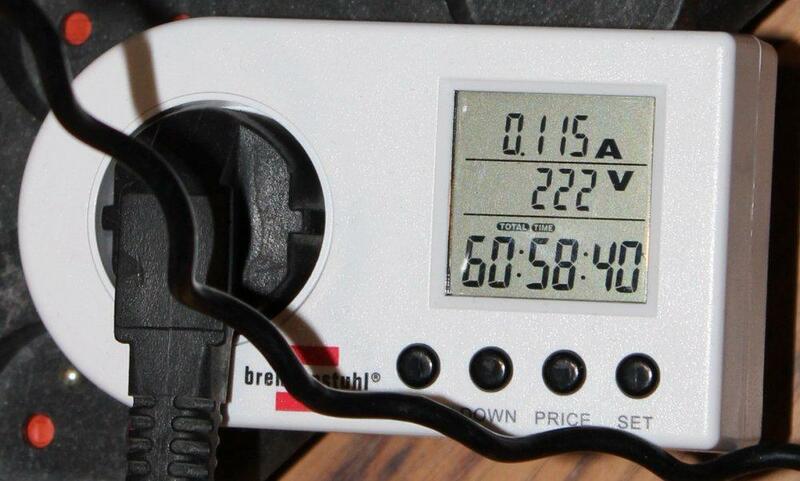 What's interesting is that the power brick on its own uses some power. 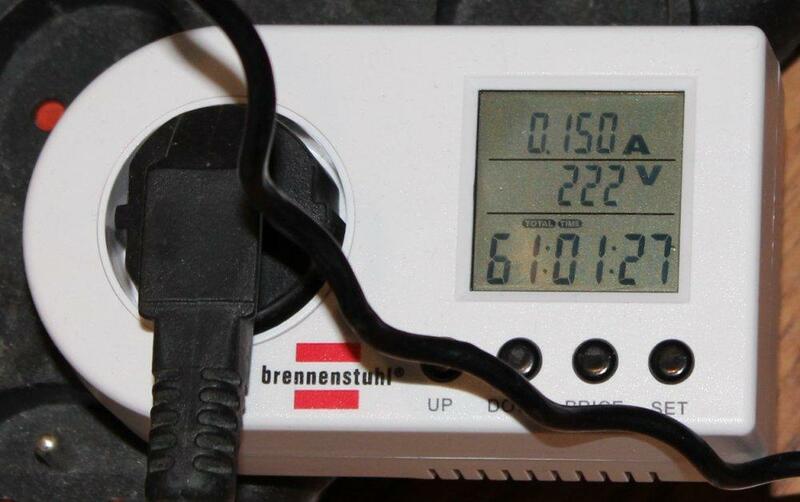 The stock 60W power brick when connected to the monitor showed 0.046A (10W), while my 120W universal power brick (made by Trust) showed only 0.02A (4.5W). When connected to the PC (but not turned on) it jumped to 0.024A (5.5W). So even when something is not on it will use some electricity. The good and eco-friendly way is to switch the PDU off (or unplug it) when the devices are not used. Also quality power supplies tend to have better efficiency than cheap ones. The case has no fans so high CPU temperature may be a problem. Highest temperature I've observed was around 67C at very high load. If one of the RAM SODIMMs wouldn't be covering the top vent from the CPU radiator then it could be slightly cooler. Also the test wasn't made in sunny and hot day - then it could get to hot. One solution is to use a case with a big fan (for example Antec ISK100) or to place such fanless mesh case on a laptop cooler plate with a big fan. This Mini ITX board has HDMI and D-SUB connectors and can handle two displays. The micro ATX version or the newer mini ITX also have DVI. Two full HD displays were handled without problems so this motherboard can be used as a developers PC for me and in the office (where two displays are a must). Using SSD makes every file handling operation fast. The OS boots quickly, although not as quickly as on i7. The system is fully responsive, there are no lags. Adobe Flash on YouTube works well making plugin-containe for Firefox use 35% or bit more CPU. I've also tested the PC on 4K Hobbit trailer. On YouTube it lagged a bit but was playable (almost 400% load so all cores used). After downloading it as MP4 (242 MB) it was easily playable by parole (150-250% CPU) and gnome-mplayer (bit more CPU usage), but was very laggy on Kaffeine (up to 100% CPU so it can't go multi core). Intel can makes good CPUs and J1900 is quite good. You could want more GPU or RAM speed, but still for the price and power it's a nicely done chip. When having four cores it would be good to have 16 GB of RAM for those special cases like virtual machines. It's very good that Asrock overcome the 8GB limitation - it's not needed often but for me is one of key features so I had to place it in the review. It's not i7 but it's fanless and that's an important feature when I don't want to hear any buzz when watching TV or browsing the web after work. AMD may offer more graphics with their new Athlons, but for me the level of performance offered by Bay Trail-D is enough. Successor of Bay Trail will be Braswell family based on Broadwell designs and graphics (so a big jump from Ivy Bridge graphics). They will probably show up by the end of 2014 (or later?) and ought to provide much more processing power per watt (14nm process) as well better graphics. Who would think that saving electricity would be done by plain technology advancement. I'm also curious how much better is the Pentium J2900 clocked higher than J1900. Few percent probably. At the moment it is available only in pre-made Acer, HP and alike PCs. Can't find any motherboard with it.